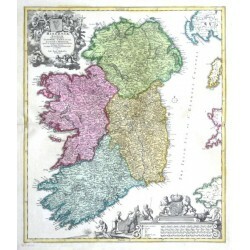 "Irlandia". Pův., staře kolorovaný mědiryt podle Duvalovy mapy z roku 1660. Ryl S. Hipschmann. 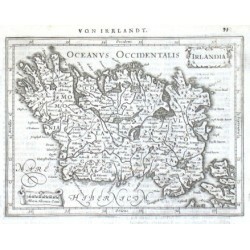 Vydal J. Hoffman, 1678. S dekorativní titulní kartuší. 13:10,5 cm. "Irlandia". Orig. 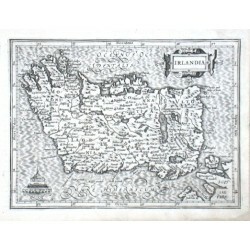 copper-engraving from Mercator's Atlas Minor published in Amsterdam by J. Hondius, 1607. With ornamental title-cartouche and another ornamental cartouche with the sclae of the map ("Miliaria Hibernica Comunia"). 14:19 cm. "Udrone". 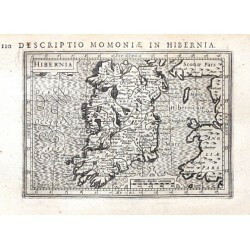 Copper-engraving from Mercator's Atlas Minor published by J. Hondius, 1613. 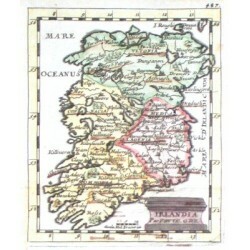 With ornamental title-cartouche and French heading-title ("D'Irlande"). 13,5:17,5 cm. 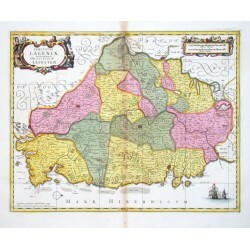 "Ultonia Oriental". 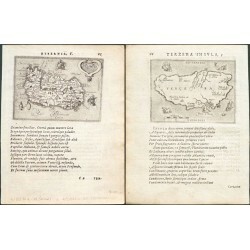 Copper-engraving from Mercator's Atlas Minor published by J. Hondius, 1613. 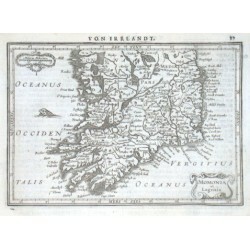 With ornamental title-cartouche, ship, sea-monster and French heading-title ("D'Irlande"). 13,5:16,5 cm. "Comitatus Lageniae". Copper-engraving by P. Kaerius published by J. Janssonius, 1648-51. 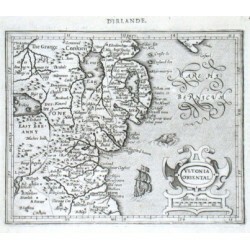 With ornamental title-cartouche and German heading title ("Von Irrlandt") above the map. 15,5:20,5 cm. "Momonia et Lagenia". 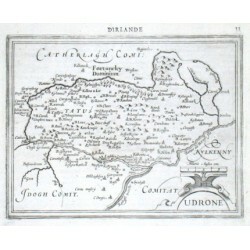 Copper-engraving from J. Janssonius' Atlas Minor, 1648-51. 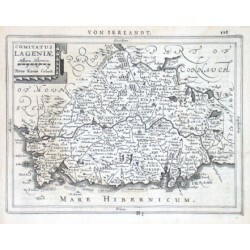 With ornamental title-cartouche, another cartouche with "Miliaria Hibernica", sea-monster and German heading title ("Von Irrlandt") above the map. 13,5:19,5 cm. "Irlandia". 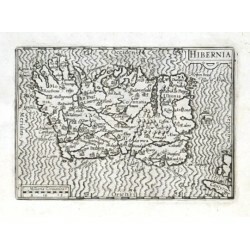 Copper-engraving from J. Janssonius' Atlas Minor, 1648-51. With ornamental title-cartouche, another cartouche with "Miliaria Hibernica Comm." and German heading title ("Von Irrlandt") above the map. 14:19 cm.